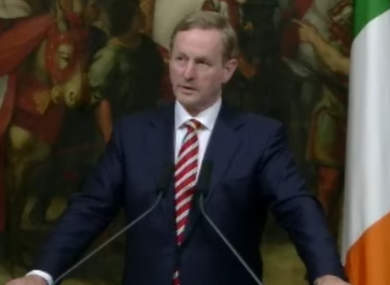 Enda Kenny, speaking in Rome, borrowed a local proverb in claiming: "Caesar's wife has to be above reproach." FIANNA FÁIL LEADER Micheál Martin has offered comprehensive backing for his party colleague John McGuinness, after Taoiseach Enda Kenny added his voice to the chorus of criticism for the chairman of the Dáil’s Public Accounts Committee. Martin this evening offered a spirited defence of McGuinness, claiming attacks on him from Fine Gael and Labour “reek of political opportunism”. His defence came after Enda Kenny, speaking in Rome, described McGuinness’s behaviour is “damaging” to the credibility of Irish politics – saying his stance “smacks of the abuse and arrogance that we inherited after 14 years of mismanagement”. It emerged this morning that McGuinness had sought to bring his wife with him on official state trips while he served as a junior minister with responsibility for trade and commerce in 2007 – seeking to bring her on a second trip even after her first one was queried by civil servants. The Irish Independent revealed that McGuinness had offered to pay for his wife’s travel to Dubai himself, and sought to bring her on a later trip to Canada, but argued on a more general point that there were cases where the State should cover the cost itself. McGuinness defended his stance this morning, saying travel for ministerial spouses was currently covered for travel around St Patrick’s Day. This evening, after a meeting with Italian premier Enrico Letta, Kenny said the chairmanship of the Public Accounts Committee was “a matter of credibility and respect of politics and accountability” – and borrowed a local proverb to suggest that McGuinness should step down. “I know I’m in Rome, and the old saying is that Caesar’s wife has to be above reproach,” he said. Kenny stopped short of calling for McGuinness’s resignation, however – saying his status was up to Fianna Fáil leader Micheál Martin to decide. The chairmanship of the Public Accounts Committee is usually given to a member of the largest opposition party, as a nod by the government to the need for outside scrutiny of State spending. “While I’ve been accused of being involved in power grabs,” Kenny said, “I made it perfectly clear that the chairmanship of the Public Accounts Committee should rest with the main opposition party. This evening Micheal Martin offered a staunch defence of McGuinness – brushing off any suggestion that he is unfit for his €9,500-a-year position. “It has always been an accepted principle that the role of Chair of the PAC was above politics and that all parties would respect the independence and impartiality of that role, no matter what parties were in government,” Martin said in an emailed statement. “The only appropriate test was whether the individual who held the role was exercising their authority in an independent, transparent and non-partisan way. No one, from any corner of politics or the media, has questioned John McGuinness’ performance as Chair of the PAC committee in this regard. Martin said the criticism of McGuinness’s stance showed “a fundamental disregard for the independent role of the Public Accounts Committee and its Chair”. “Their comments reflect more accurately on the agenda of Fine Gael and Labour than they do on the position or of John McGuinness as Chair of the PAC,” he added. Email “FF leader stands by McGuinness as Kenny brands him 'damaging' to politics”. Feedback on “FF leader stands by McGuinness as Kenny brands him 'damaging' to politics”.